Home Community Superior Silhouette Artist Cindi Rose, Sultry Singer Ashley Forrest and Comedian Don Barnhart are Winners! October 1, 2012- Gigmaster’s Talent agency’s top ten Photo contest winners – A picture can say a thousand words, and with Gigmasters on-line talent agency, it is important that the incredible entertainers have photos that show their top talents. Gigmaster’s Peter Gavin, thought, what would be better than to have a contest, with fans voting for their favorite bands, musicians, and celebrity artists, by their pictures! Just by sharing through the social networks, the voting was done and the wonderful winners were announced! The best press photo went to comedian hypnotist Don Barnhart, star act individual solo winners went to fabulous Elvis impersonator, Rick Torres, superior silhouette artist Cindi Harwood Rose, and beautiful singer Ashley Forrest. Other great musical group and band winners were Highland way Productions, Dina Preston Band, 74th Street Band AMAT Entertainment, GTR, and Dolce Vita Strings. Gigmasters is the place you want to go to when you are planning an event, business meeting, Bar or Bat Mitzvah, party, wedding, or school fund-raiser. 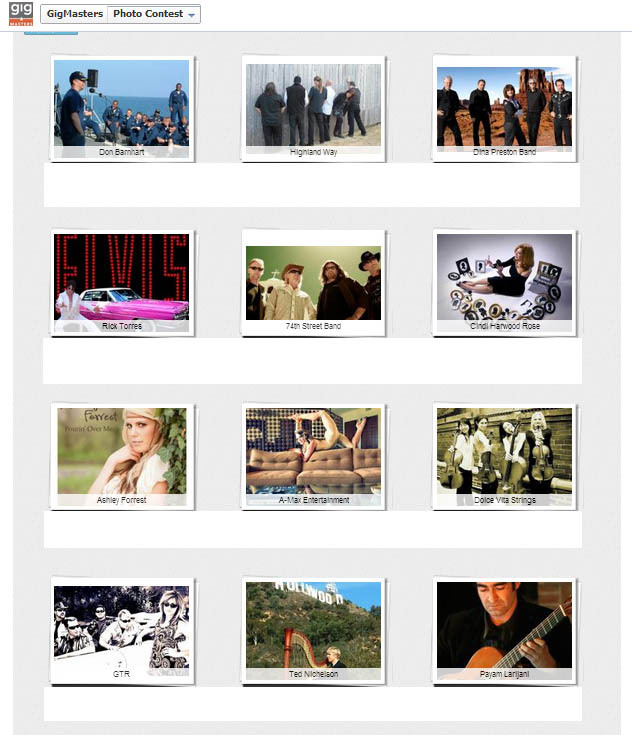 The top talents are listed, and easily, with a few clicks you can have an amazing venue. Artists like Cindi Harwood Rose can be hired to commentate at an art museum or entertain at an event, fundraiser, school, birthday party, celebration or wedding; while hypnotist and comedian Don Barnhart is popular on college campus graduations as well as corporate events. It is easy to have the premier party or function when you use Gigmasters to scout your talent, just log-on! Featured in this article is the foremost winners of the photo contest, showing Cindi Harwood Rose with many of her timeless and classic, yet modern, silhouette artistry and the amazing Dina Preston Band, as well as the cool group 74th Street Band, amongst others.